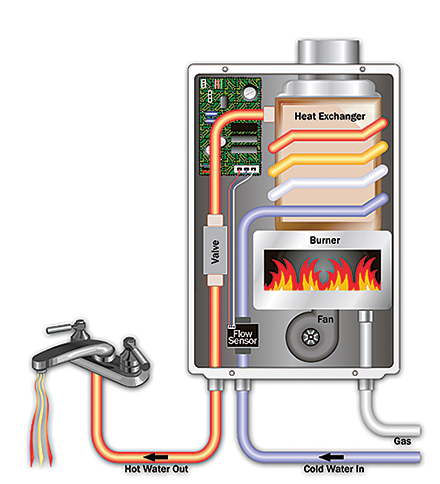 Provides you with continuous hot water... in one of the most energy-efficient ways possible. Conventional tank-type water heaters will heat and store a set volume of water, regardless of whether someone is using that hot water or not. Because our water heaters only activate when hot water is being used, no standby energy losses are incurred, providing efficient heating while conserving energy. 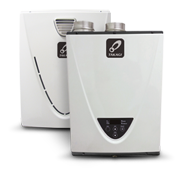 On top of all this, a Takagi tankless water heater takes up much less space than your conventional tank-type water heater or boiler. With no tank or boiler to steal valuable storage space, Takagi's wall-mount design allows for additional storage and flexibility.